AngularJS MVC explains about angular Model, View & Controller and the relation between these three angular components. MVC is a software design pattern that is primarily used to develop web applications, which divides the components of an application to separate the responsibilities. Using MVC pattern, the various components will have a relationship defined by their interactions. Model has the data and logic and is used to represent the current state of the application. View is used to display the data and Controller is used to control the relation between Models and Views. Below is the detailed description of MVC. AngularJS framework works on MVC design pattern. 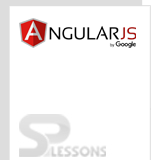 Model: AngularJS Model is used for handling the data from server to controller and vice versa. View: View is a HTML page. Controller: Controller can control the whole application and is responsible for interaction between the view and model. Model is responsible for the current state of application data. It will receive requests from view and follow the controller instructions. Model sends request to the server to save data in database and retrieves the data from database using server side scripting. Model can respond to view request. View is responsible for formatting the data that is prepared by the model and displays the output to the user. In AngularJS, it is created with HTML. Most of the applications move past the single view model; in such case the HTML components that create the view will be stored in individual files. As AngularJS is famous for Single Page Application, only some part of the page represents the current view. In this case, body contents represent the view while the HTML and HEAD elements form the container for the individual views. Controller will control the entire application. It receives requests from View. Controller will combine with the model to prepare the data and respond to the view request. In the above code, a model named ‘users’ is created, which is an array of objects. Now, controller is set up and models are defined. To display data to the user, a view has to be created. 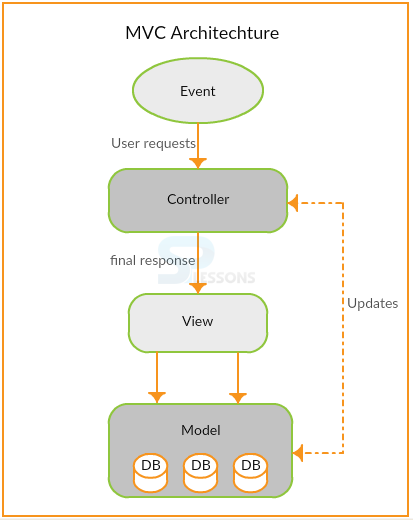 MVC is a software design pattern with model, view and controller. Model is responsible for the current state of application data, View displays the output and Controller handles the interaction between View and Model.